On January 22, 2019, the North Carolina Department of Commerce announced that it’s investing $260,000 in Downtown Strong, a program to build local government capacity by providing economic development planning and revitalization resources and guidance. The program is a result of feedback gleaned from Governor Roy Cooper’s Hometown Strong initiative. Downtown Strong will operate out of the Department of Commerce’s Main Street and Rural Planning Center. Downtown Strong will provide a downtown assessment of each participating community, as well as staff training, technical assistance and other resources. Services and resources will use the Main Street America™ approach, which establishes economic development strategies and implementation plans through economic vitality, design, promotion and organization actions. The traditional Main Street program includes a Downtown Associate Community program for smaller communities or those just starting revitalization efforts. Downtown Strong will help interested communities prepare to become Downtown Associate Communities or will help them prosper on their own. The program is available to all eligible communities in North Carolina. If you’re a local government official and would like to learn more, email Liz Parham, Director of the NC Main Street and Rural Planning Center, for more information at lparham@nccommerce.com. 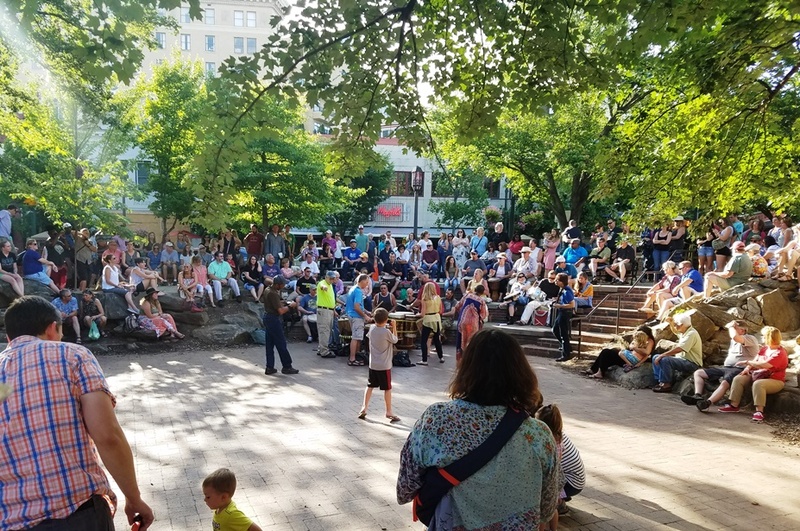 Photo of popular downtown park in Asheville, NC by Storm Cunningham. See the NC Main Street & Rural Planning Center website.